Municipal Art Gallery The Municipal Gallery of Rhodes today houses one of the most representative and authoritative collections of 20th-century Greek painting. Most of the painters who worked creatively during these nine decades are represented in this collection through some of their most characteristic works. Whether you're up for swimming, surfing, yoga or more unusual kinds of leisure sports, Rhodes is an excellent place to get moving and offers plenty of opportunities for recreational sports. Prasonisi beach and the east shore are perfect for surfing, windsurfing and kitesurfing, which are by far the most popular sport activities on the island. Paragliding has become the newest, but at the same time the most hip flying sport in Rhodes. You might also like to explore the island by horse, as there are many opportunities for horseriding. But, if you are a bit more or the active site, you can also choose to join a bicycling tour. There countless opportunities for sporting activities. There are running tracks and other athletics facilities at Diagoras Stadium and at Karakonero (on the Rhodes-Kalithea road). A popular place for jogging is the ancient stadium. You can now play badminton in Rhodes, so why not go to this friendly club. Mon-Fri, mornings only. Racquets and shuttlecocks available for hire. There are now 5-a-side football pitches all over the island, and many have lessons for juniors. Good ones in Rhodes town include Rodos Mini Football on the Rhodes-Lindos road, just past Rhodini, and Oasis, near the hospital. Track with Bullet and Junior carts at Stan’s Go-Karts in Faliraki. There is an 18 hole, par 72 golf course in Afandou open 12 months a year. An Open Tournament takes place each October. There are many good gyms all over Rhodes. Those at the Grand Hotel in Rhodes town and Paradise hotel in Koskinou are open all year round and have swimming pools. My wife recommends Asana in Rodini, which has a supervised play area for children. There are many good walks on Rhodes. Although it is now a little out of date, Sunflower Books’ ‘Landscapes of Rhodes’ lists several in detail, including an ascent of Ataviros from Embona and climbing Profitis Ilias from Salakos. You will find many horse riding cloubs on the island. 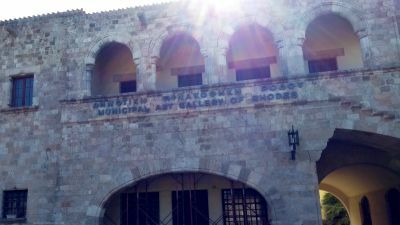 The Nautical Club of Rhodes (N.O.R.) at the Nothern end of Elli beach in Rhodes town offers lessons (in Greek). Rhodes is the most important centre in the Aegean for yachting. If you have your own boat you can moor it at Mandraki harbour (+30 22410 27690). There is no size limits for boats and all modern facilities are available. Mooring fees on application. Please be warned that entrance is dangerous in strong East to South winds. There are dive companies located at Mandraki harbour. The boats leave about 9am and arrive an hour or so later. Beginners can do a shallow-water ‘try dive’, those with existing certification can do a couple of more advanced deeper dives, one of which explores a cave and tunnel system. The Hilton hotel in Ixia has two courts with racquets available for hire. Tel 22410 74014. The tennis club in Karakonero (see below) has professional-standard tables. In the summer hotels all over Rhodes have tables. The main tennis club is at Karakonero, on the road from Rhodes Town to Kalithea. There are two red clay courts and several hard courts with floodlights. The club also has three hard courts behind Elli Beach near the Casino. In the summer a cheaper option is to play at one of the many large hotels, although these vary widely in quality. There are beach volley courts at Karakonero, and many organized beaches offer volley courts as well. If you belong to the people that love to get out in nature and walk, Rhodes is a paradise. The weather is perfect year round for this kind of activity, and the walking paths magnificent. Waterskiing is possible on many of the beaches round Rhodes, including Ixia, Faliraki, Lindos and more. Parasailing, ‘banana rides’, ‘ringo-ing’, sea kayaks and others are available at beaches around Rhodes including Elli beach in Rhodes town, Faliraki, Afandou, Lindos, Kiotari. Rhodes is renowned as one of the best windsurfing spots in the world. Real pros head for Prassonisi at the far south of the island, but conditions are also ideal on the West coast off Ixia and Ialyssos for beginners or the more experienced. Kitesurfing is also growing in popularity. For yoga classes and retreats on Rhodes see http://www.yogainrhodes.com. Beach volley is a sport that has been tremendously richer in the world over the last few years. Rhodes Island was a great bridge of events around the world and across Europe. Seeing the island at your own leisure on the back of a bike is an unforgettable way to experience Rhodes. There are places which offer holidays based solely around riding, with accommodation right at the stables, and places just for a daily horse riding excursion. It all depends on what level you are after. Rhodes has some spectacular diving spots and it doesn’t matter if you are a first time diver or very experienced, diving here is a joy. For those that love to get out in nature and walk, Rhodes is a paradise. The weather is perfect year round for this kind of activity. When you are on and island, you’ll naturally find opportunities for water sports everywhere. Rhodes is no exception and in fact because both sides of the island have different features means that the choice becomes even larger.